I was not an early convert to Pinterest. Even when a friend helped me set it up, I dragged my feet. Messing around with it might be fun, but there were so many other things I needed to do. However, when we moved to a new house, I began to see why people like the app. At first it was strictly business—a shopping tool and resource for household tips. Our new house needed shower curtains, porch furniture, light fixtures, and a stool for the kitchen counter. The app became a good place to save photos and links for furnishings that I wanted to show to my husband. Next, I searched for advice on nontoxic ways to clean the shower. I was immediately bombarded with pins for shower cleaning tips along with photos of gross toilets that needed an intervention. I wanted to say, “Wait, no need! I’ve already know what to do about the shower, and God help me if my toilet ever looks like that!” But like most online apps, it’s programmed to show you more of whatever you searched for in the past. The real magic happened when I followed a few friends. They like such cool stuff—who knew it even existed? 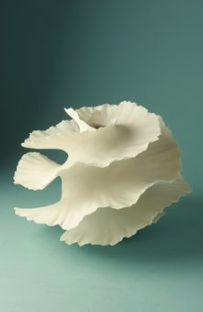 I’d never have found such amazing ceramic sculptures or incredible fiber art if I hadn’t started following a sculptor friend and seeing her pins. That led to people across the world pinning my pins. Amazing. My friends’ pins also led me to explore in a more playful way—not searching, just wandering in playland. That’s how I learned more about jadeite glass and how to grow fragrant lemon seedlings from lemon seeds . . . in case I ever want to. Now Pinterest is my first stop for recipes, crafts, and garden ideas. I’m not a clever person who thinks up how to make Santa hat appetizers from strawberries and banana slices, but now I can impress my friends with that trick if I ever need to. 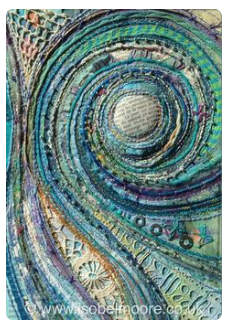 Messing around in the quilting and sewing pins gave me a zillion ideas for projects. 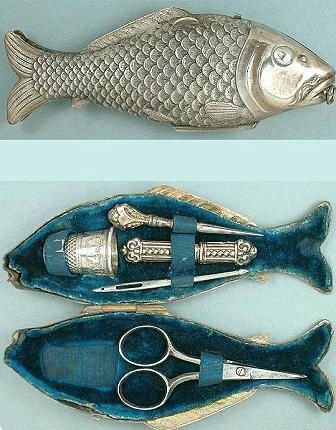 And I never would have seen antique sewing scissors and sewing kits without Pinterest. 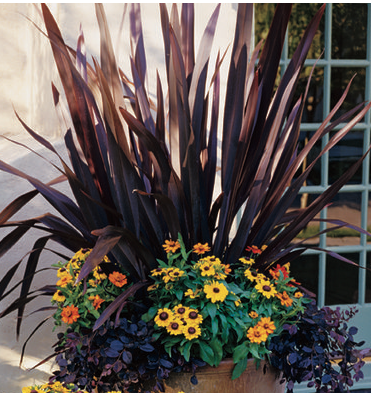 This year, when I started planning my flowerpots for the patio, I turned to Pinterest for inspiration. What I’ve discovered is that at worst, Pinterest is harmless, but addicting, fun. I can collect eye candy and daydream (without obligation) about cool projects I might do. At best, it’s a good resource for inspiration. This is not a paid advertisement. 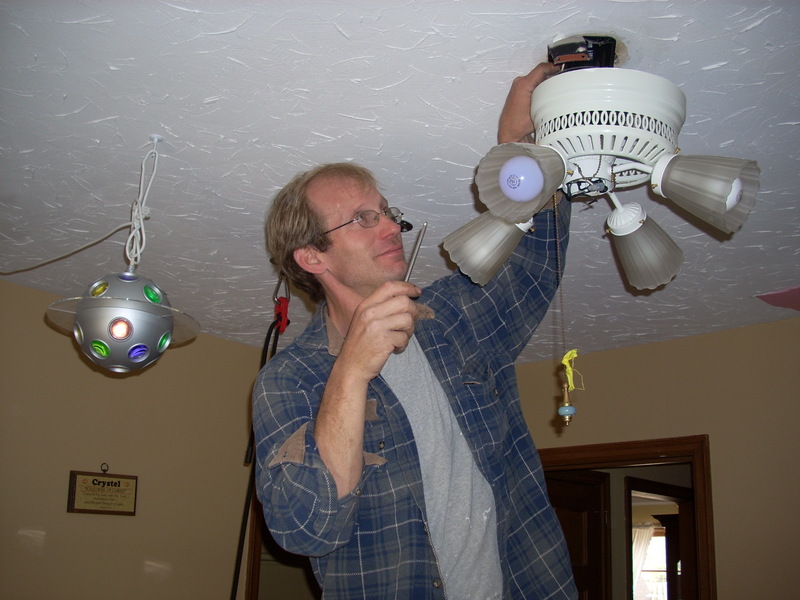 On April 28th, an article in the Star Tribune written by Paul Muschick stated that in 2012 the home repair industry was the most-inquired-about industry at the Better Business Bureau (BBB). It was also the second-most-complained about. My family is lucky we found Tim. When you have children you acquire (whether or not you want it) – a calendar – that posts events in your mind that are Before Kids or After Kids. Tim belongs in the Before Kids category. Our relationship started simply enough. Leaving the YWCA in Uptown, Jody lifted his business card off of the advertisement board. We were dating then. She had witnessed my attempt to block birds from nesting inside the air vents on the roof. Thank goodness a storm blew through Richfield breaking my windows and leaving me with hail damage. Insurance would pay for a new roof and I’d have to hire someone to do the work. I had a history of floundering as a homeowner. An electrician I had asked to make a repair in the bathroom mangled an outlet and the wallpaper. It was never the same again. The contractor I hired to put on the new roof was unable, even after many attempts, to fix the leak on the porch roof. Finally, I put a cake pan inside the ceiling to catch the dripping water. Tim smiled, handed me my cake pan. He fixed the leak and has been with us for over ten years. We’ve had him longer than we’ve had the children. I think of us as growing up together: Tim, Jody and me, Antonio and Crystel. Our relationship has matured to the point where we keep a running list of any repairs we need done and schedule him in the spring and fall. Tim lets himself in and finds the list on the counter. I look around our home and there is little that he hasn’t touched. He’s painted and tiled, painted and tiled. Put in an egress, trimmed trees, planted trees, tilled our garden, put up fences, taken down fences, removed the window that kept slamming on Crystel’s hand and in its place put in a patio door. He’s taken apart and put together exercise equipment, desks, futons, and beds. He’s put in windows, taken out windows, the same with doors. He’s tuned up what needs tuning in the spring and fall. I have even had him change light bulbs. Jody couldn’t believe that. She said she could do it. I told her, that I knew that she could but that it goes on the list and if it wasn’t done by the time Tim came then he’d do it. Now she’s a believer. The kids are too. 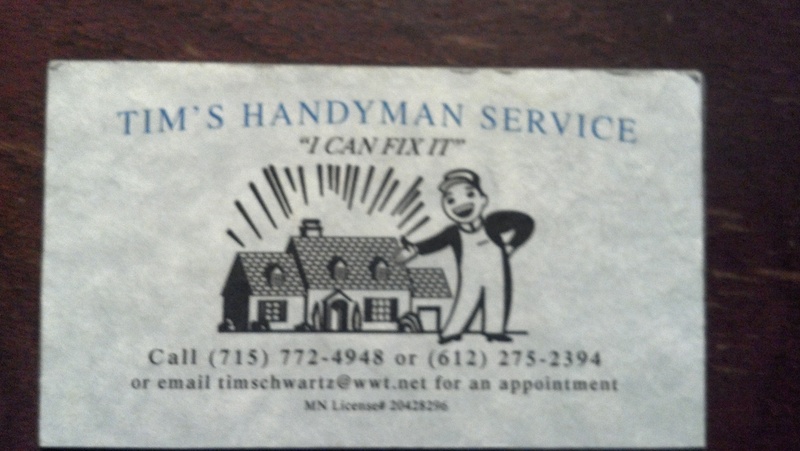 When something needs repair, even a toy, they say, Tim can fix that and we put it on the list. Tim is a person of few words. 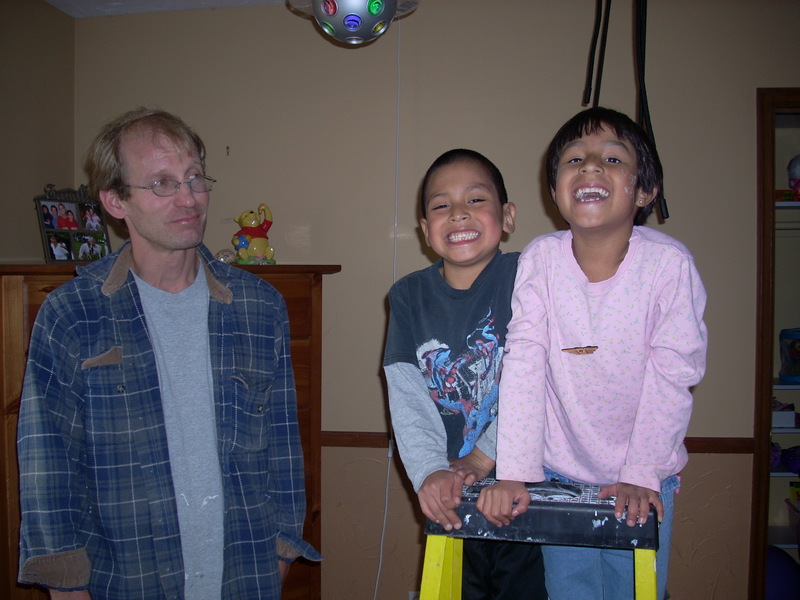 He never said anything when I had him make a jungle gym on the second floor for the kids. If I could imagine it, he could do it. They had a swing, a climbing rope, trapeze bars. He never said a word when I had him take apart Crystel’s bunk bed and move it to the finished basement letting her transform her closet into a cave. Hopefully, he’ll have few words when I have him bring the bunkbed back to her room. Our latest project has been changing our 3-season porch into a 4-season and taking down the wall between the kitchen and the porch. First, he added new windows and a door on the east side, then he added windows to the west side, and he just finished the mudroom – from conception to completion. The couch he built has storage underneath the cushions. Next year the wall will come down. 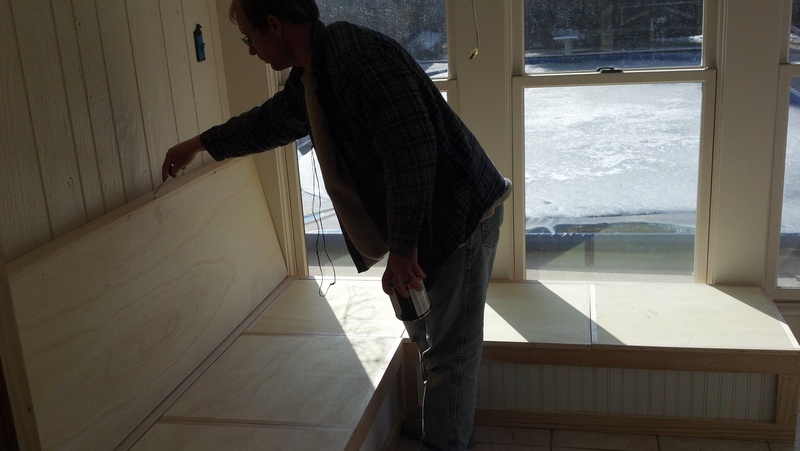 In-between the large projects, Tim has lists. This summer, if all goes as planned, he will be working with Antonio and Crystel to build a tree house in the backyard. We wanted someone to show the ten-year-olds how to use tools. Who do you call for that? Tim, of course. The BBB advises homeowners to take the time to choose a trustworthy contractor. What I like most of all is that at any given time, I have a home that I am proud of. I have Jody and a handyman to thank for that. Email timschwartz@wwt.net for an appointment.